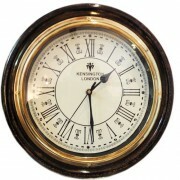 Antique Wall Clock-B Dimension : D-16 Inches Approx. High-end antique timepieces are becoming ex..
Dimension : D-16 Inches Approx. High-end antique timepieces are becoming extremely rare and quite expensive to collect. Dharohar The Heritage offers replicas of antique timepieces, these clocks are all highly collectible and produced in limited quantity. The case of this “SMITH” London wall clock is made of softwood in a tamarind aged black finish adorned with an elegant brass bezel mounted on it. Its off-white metallic dial is powder coated, with burnished black metal hands. This wall clock is an elegant & aesthetic decor accessory and collectible that blends exquisitely into elite settings, be it home or office.